in the industry. I know my fields will be clean because it’s a good product. STINE HAS WHAT I WANT AND WHAT MY FARM NEEDS. I CHOOSE QUALITY. I CHOOSE RESULTS. I choose what I can count on. I choose Stine because…Stine has yield. An in-depth look at the dicamba issue. What happened last year and what's ahead for next year. See pages 26-29. On the Cover: An employee of the Iowa Northern Railway prepares to throw a switch while moving grain near Nora Springs. The Soy Transportation Coalition will continue to be an advocate for soybean farmers by working on load testing for rural bridges, funding for locks and dams and promoting expanding semi weight limits among other items in 2018.
have imagined. ISA has changed dramatically in those 25 years, but so has Iowa agriculture and the farmers we have always served. From the growth in production and demand, to the introduction of new technologies and new ways of farming, there has never been a dull moment in the corner office at ISA. I have been blessed to work with and for some really talented and dedicated staff and farmers. Having served in this role for this many years also means I've been able to participate in the formation and growth of many related soybean organizations and efforts. One of those I'm most proud of is the North Central Soybean Research Program (NCSRP). Incorporated in November 1992, NCSRP was formed by a small group of soybean checkoff farmers. Representing a handful of Midwest states, the farmers’ goal was to improve the coordination and the effectiveness of checkoff investments in soybean research in areas of mutual interest across the region. By 1993, eight state soybean checkoff boards were members of NCSRP. In just a few short years, all 12 of the states in the north central region had joined. I was pleased to serve as the state coordinator in the early days of the organization. When I do finally retire, I know I will look back at the success of NCSRP with fond memories and an appreciation for what the group has accomplished. Likewise, we have also included a story about the significant role the Soy Transportation Coalition (STC) has played in its first ten years in elevating transportation issues and offering solutions. With an office here at ISA, Mike Steenhoek has served as the executive director of the organization since its inception. He has also been blessed with an outstanding set of farmer board members. 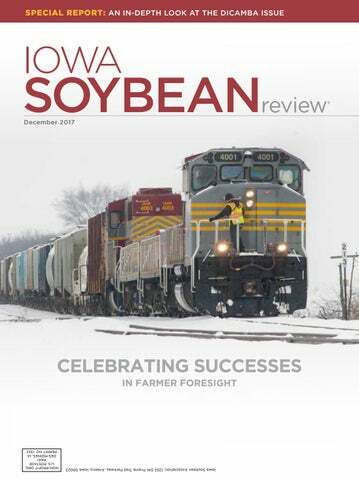 I hope you enjoy this issue of the Iowa Soybean Review. From all of us here at ISA, best wishes to you as we prepare to celebrate Christmas and the New Year. Kirk Leeds pictured in the "corner office" at the Iowa Soybean Association in 1999. This image appeared on Leeds's column in the Iowa Soybean Review for many years. Producing healthier plants with higher yield potential. PROTECTION AGAINST SUDDEN DEATH SYNDROME Escalate SDS is Beck’s standard EscalateTM seed treatment with ILeVO® fungicide for an additional layer of protection against sudden death syndrome (SDS) on soybeans. Escalate SDS protects the root system from SDS fungus in the seed zone and mitigates the above-ground, late-season damage caused by the SDS fungus. Escalate alone provides a 6 Bu./A. yield advantage over untreated seed, and the protection of ILeVO included in Escalate SDS adds an additional 2 to 4 Bu./A. With Beck’s Escalate SDS, you’ll get the power of ILeVO for the reduced cost of $8.95 per unit (full rate), the best value in the industry. BecksHybrids.com | 800.937.2325 Escalate™ and the Escalate logo, are trademarks of Beck’s Superior Hybrids, Inc. Poncho®, VOTiVO® and ILeVO® are registered trademarks of Bayer. ive years ago, prompted by problems of hypoxia in the Gulf of Mexico, Iowans bought into a program that would attempt to reduce total nitrogen and phosphorus loadings to Iowa’s rivers and streams by 45 percent. In five years, the Iowa Nutrient Reduction Strategy (INRS), a joint effort among Iowa Department of Natural Resources, Iowa Department of Agriculture, Iowa State University and several farm and urban groups, has gone from a paper concept to action on the ground. It is showing results. A recent Watershed Planning Advisory Council (WPAC) meeting outlined its progress report of the INRS for the year and since its inception. The observations included: 1. Municipal wastewater plants are making progress on updating their facilities and renewing their permits. (105 new permits and 51 feasibility studies completed). 2. Farmers planted more than 600,000 acres of cover crops in 2016, up from 15,000 acres in 2011. Farmers and landowners invested about $8 million in cost share contracts. challenge: the capacity for acceleration. Funding is the issue—but not simply more money. More predictable money. Right now, nearly 55 percent of the funding comes from grants and annual appropriations. The report states, “In the long term, this type of funding is difficult to rely upon for management programs that will maintain ongoing INRS progress. While many programs are in place to further the INRS, there is great need for developing other opportunities and investments that will support the enormous level of scaling-up that is required.” The Iowa Nutrient Reduction Strategy, with its watershed work and rural urban collaboration, is beginning to show what's possible. But true success will require focus and financial commitment beyond annual appropriations and grant awards. Hopefully before we reach our tenth anniversary, we’ll have made that commitment. • $2.8 million in dedicated funding toward soil conservation, water quality and nutrient reduction. This includes state and federal grants, contracts and soybean checkoff investments. • 4,121 water samples collected and analyzed from 187 stream sites and 435 edge-of-field sites. • 149 outreach pieces showcasing nutrient reduction strategy efforts including media interviews, articles in Advance and e-weekly newsletters, Iowa Soybean Review and ISA's annual research report. • 56 field days, tours, and watershed events with more than 1,800 attendees. • 18 soil and water presentations to 490 attendees. • Three scientific peer reviewed papers accepted for publication. Demonstrating sustained progress toward meeting the goals of the INRS will continue to be an important endeavor for Iowa. ISA and several other partners support the development and use of watershedbased strategies designed as a pathway to scale up implementation of INRS practices. In most cases, these plans are supported by grants from IDALS and others and are directly supported by local partners who are leading implementation activities. In most of the locations, the watershed-based plans are being used to transition from the demonstration phase to implementation scale-up of practices and projects. ISA is pleased to make progress with the tools and resources provided and optimistic to continue to build on this success. Don't miss guest speaker, Sue Martin! She is a regular Senior Market Analyst on the syndicated show Market to Market on Public Television, and a guest analyst on US Farm Report and AgDay. Martin will offer insights to this yearâ&#x20AC;&#x2122;s agricultural markets. ALL YOUR MONEY WORKS FOR YOU. No transfers. No hassles. No added days of interest. No other line of credit is designed to be more convenient or economical for agriculture than a WorkSmartSM line of credit. You aren’t charged interest until you actually spend the money. And with Remote Deposit, you can save time by applying payments and third-party checks directly to your account – anytime and from anywhere – stopping interest on the payment amount. Combined with our AgriBuy® Rewards Mastercard® and cash-back dividends, WorkSmart can mean hundreds – even thousands – of dollars difference compared to other lines of credit. Check it out and see for yourself – learn how much you can save at fcsamerica.com/WorkSmart, or call 800-884-FARM. Terms apply. See fcsamerica.com/terms for details. GERMINATE. DOMINATE. REPEAT. Demand high yields with Titan Pro seed. Visit our website www.titanprosci.com to find a Titan Pro dealer near you. THANK YOU TO OUR 2017 CORPORATE PARTNERS! Iowa Soybean Association recognizes these industry stakeholders for their involvement and support in 2017. Their investment of time, talent and resources improves the competitiveness of Iowa soybean farmers and strengthens the association. Thank you. We look forward to continuing our important work in 2018 and beyond. At ADM, everything we do starts with you. OUR CAREFULLY CULTIVATED SUITE OF TOOLS AND STRATEGIES ARE DESIGNED TO HELP YOU PROACTIVELY MANAGE YOUR GRAIN MARKETING. Whether you like to take an active role in the execution of your contracts, or you prefer to leave it to the experts, our reliable professionals are there for you, giving you the guidance you need to stay competitive for years to come. Talk to us about our grain marketing or visit ADMadvantage.com to learn more. with BASF soybean solutions. Always read and follow label directions. he national soybean checkoff has been responsible for numerous projects and programs to help farmers remain sustainable and profitable. Enacted in the 1990 Farm Bill, national checkoff-funded resources have allowed soybean farmers across the U.S. to build international trade and export markets and invest in new soy uses and production research to maximize yield. Marlyn Jorgensen of Garrison was one of many soybean leaders who worked to get the national checkoff program implemented. Only recently retired, Jorgensen began farming in 1963 and became active with the Iowa Soybean Association and American Soybean Association (ASA) in 1971. He served in various capacities for both organizations, including ASA president (1989-1990). Jorgensen shares some of his thoughts looking back on the work he did and where he sees the future of agriculture. back then. We worked with Walter Fehr of Iowa State University on crop varieties and even low linoleic soybeans. One of the biggest new uses successes was when the Cedar Rapids Gazette began to use soy ink. It was the first large paper in the U.S. to do so. How would you explain to nonfarmers the importance of trade? You have to look at the total economy and the tremendous job creation with exports. Non-ag people don’t see it as much, but if you look at soybean uses around the world, it’s exciting. Processing soybeans into oil and meal and shipping them overseas is a great use of the total bean. When it comes to feeding the world, that’s a moral calling. It's about making sure people have enough protein around the world, as well as an economical value to farmers. How has the ag industry changed in the last 30 years? How did early investors help farmers today? Just laying the foundation and getting everyone to understand the importance of investments. You have to start with a good base if you’re going to build a good house. Even before my time there were people writing checks to do something that had never been done before – like investing in Japan. Consolidation both on and off the farm has also been a big change. Prices and yields have greatly improved thanks to research, genetics and technology. I’m hopeful we’ll continue to invest in research and market development to make sure we have a bright future ahead. What advice would you give to farmers who are deciding which projects and programs to invest? One of the big things is to listen to your members and find out what’s important to them. They also have to be forwardthinking. You can’t just do the same thing over and over. Look for new opportunities whether they are research or new uses. I think new uses is always a top priority. We have to be looking outside the box of where we can go to create new demand. Obviously, the bottom line is to make sure producers remain profitable, but where can we invest research funds to keep farmers sustainable and environmentally friendly, which is of prime importance? I’m thinking it’s water quality, and the soybean industry is one of the leaders of that in Iowa. leaders to invest scarce checkoff funds more than three decades ago in a communist country that was a soybean exporter with no immediate payback was a risk, industry officials agree. In the early 1980s, China — once a closed society — was opening up under new leadership and talking about introducing some capitalism and free markets. The U.S. and China re-established full diplomatic relations in 1979. Kirk Leeds, CEO ISA, has visited China more than 20 times in efforts to expand the market for Iowa and U.S. soybeans. Export Council (USSEC) North Asia director, in a video about soybean demand. 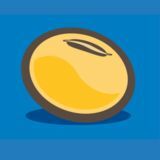 “Twenty percent of soybean imports are used for soybean oil for cooking. And, consumers are frequently using soy sauce, soy paste and tofu. “So, they are consuming soy for breakfast, lunch and dinner,” he adds. Leap of faith For the farmers who took a leap of faith decades ago, they’re still in awe of the success of early checkoff investments in China. Norman Chambers of Corwith was one of many visionary farmer-leaders that realized the nation’s potential. He was a former chairman of the Iowa Soybean Promotion Board in 1984-85, United Soybean Board (USB) secretary in 1991 and Iowa’s representative on the ASA Development Foundation, which dispersed state checkoff funds for market development in the late ‘80s. The foundation preceded passage of the national soybean checkoff in 1991, which spawned the USB. The American Soybean Association and USB formed USSEC, which now handles market development. ASA concentrates on policy issues. In the early ‘80s, Chambers says Europe garnered most of the attention of farmers since it was the largest importer of soybeans at the time. But others believed bigger opportunities lie elsewhere. “We thought the giant was China just because of the population,” Chambers says. “Companies at the time weren’t excited about it. Many of us felt like it was the producers’ place to do it. Soybean organizations working on behalf of U.S. soybean farmers ASA The American Soybean Association concentrates on policy issues. Board oversees the investments of the soybean checkoff to maximize profit opportunities. Export Council handles market development. China started importing soybeans in the mid-1990s. Purchases gradually ramped up from about 150 million bushels in 1997-98 to nearly 1.5 billion bushels 10 years later. Jim Sutter, CEO of USSEC, has been a driving force in expanding international demand for soybeans since starting in 2010. China is the world's largest U.S. soybean buyer. In 2016/17, more than 1.33 billion bushels were sold to the country. “American Soybean Association could see it,” he continues. “As it turns out, they were right.” As national checkoff revenues increased, more was spent in China. Programs became more intense and specialized, such as livestock feed efficiency and increasing soy in feed rations. Risk management became a focus, along with aquaculture. Each nation hosts multiple trade teams a year from the other. Relationship building is stressed. U.S. soybean exports to China increase from 197 million bushels in the 2000-01 marketing year to 1.33 billion bushels in 2016-17, a 39 percent market share. “It’s a much bigger deal than anyone of us could imagine,” Chambers says. Celebration ISA President Bill Shipley of Nodaway attended the 35th anniversary gala with Leeds and Grant Kimberley, ISA market development director. As attendees fondly reminisced about the past and talked about the future, Shipley couldn’t help but think of what farmers did for the industry decades ago. “I am very appreciative of the foresight of others and every farmer should be when it comes to opening and developing the Chinese market,” he says. The 35th celebration was a little more subdued than the silver anniversary party, Leeds adds. Many buyers and farmers in attendance weren’t around when Chinese imports were taking off. “To many industry people in high positions, what’s happening now is normal,” Leeds says. The success serves as inspiration to find and invest in new markets, Shipley contends. India is a prime example. The nation usually raises enough soybeans to be self-sufficient. However, experts predict it will become a major importer as its population — currently 1.3 billion — grows, becomes more affluent and demands more protein. Sound familiar? “We have to look long range,” Shipley says. “Increasing demand is what it’s all about.” Matthew Wilde can be contacted at mwilde@iasoybeans.com. U.S. Soybean shipments pour into Chinese ports every year. U.S. soybean exports to China increase from 197 million bushels in the 2000/01 marketing year to 1.33 billion bushels in 2016/17, a 39 percent market share. Norm Chambers, of Corwith, a former chairman of the Iowa Soybean Promotion Board, realized the importance of Asia as an emerging market for U.S. soybeans. Leeds, Iowa Soybean Association (ISA) CEO and the original executive director for NCSRP. “Multi-disciplinary research across campus was not common in the early 1990s. Neither was research between researchers from multiple institutions. NCSRP from the beginning worked to change both limitations.” Three state boards – Iowa, Illinois and South Dakota – were part of incorporating NCSRP in 1992, In 1993 Indiana, Michigan, Minnesota, Ohio and Wisconsin joined followed by Missouri in 1995 and Kansas, Nebraska and North Dakota in 1998. NCSRP directors and staff from Illinois, Kansas and Missouri investigate diseased plants as part of an NCSRP summer tour (left and right). Each summer NCSRP visits a different state to see the progress of research being funded by checkoff dollars. to various state research sites. Ed Anderson (center) is the current NCSRP executive director. decisions. ISA’s current representative on the board is Suzanne Shirbroun of Farmersburg. “Being on the board is a privilege and I say that because I truly believe NCSRP is great because it’s a way to use the farmer’s checkoff dollars more efficiently,” Shirbroun said. “Research dollars are harder to come by with the economic climate of ag right snow so it’s good there’s work going on between the states and universities. We’re multiplying our research dollars when everybody is working together.” Perhaps the best way to describe NCSRP and its research is, when good people come together, great things happen. Allison Arp can be reached at aarp@iasoybeans.com. NCSRP was officially created to increase the collaboration among states, especially for soybean genetics, diseases, insects and agronomics that posed regional challenges and opportunities. The old woodchips were dug up from the bioreactor and spread on a nearby field. Two semi truckloads of new woodchips were added and the soil cap replaced so it is ready for another 10- to 15-years of nitrate removal. The drainage outlet of the bioreactor hides in the streambank buffer. The outlet was dry as the drainage control structures were in place to dry out the bioreactor prior to its dismantlement. says the bioreactor and the other conservation practices he uses helps improve soil health and water quality. Time for a recharge Recently, Bravard noticed the bioreactor was literally sagging. Its surface had subsided between 2- and 3-feet in some places, indicating the bioreactor may not be functioning well. Kult agreed. “There was a decline in performance in the last few years,” says Kult. “The numbers weren’t lining up anymore for how much nitrogen should be removed and was actually removed. That indicates it’s time to recondition it.” The old woodchips were dug up from the bioreactor and spread on a nearby field. Two semi truckloads of new woodchips were added and the soil cap replaced so it is ready for another 10- to 15-years of nitrate removal. With study comes revision “We’ve learned a lot about building and optimizing bioreactors in the landscape since installing this first one,” says Roger Wolf, director of ISA’s Environmental Programs and Services and ACWA executive director. Researchers have learned over time that if water stays too long within the bioreactor, bacteria can reduce sulfur, creating conditions for unwanted effects. A spent woodchip that was in the bioreactor since 2008 is lightweight and brittle, a sign the living organisms are gone. “The first bioreactor designs included a one-foot depression at the bottom so there would always be water in it,” says Chris Hay, ISA senior environmental scientist. “Now, they are designed with a flat bottom. Our plan is to leave enough woodchips — compact them in the excavation to flatten the bottom out, then lay plastic over that, so it will be like the new bioreactors.” In the middle of the bioreactor reconditioning, ACWA, ISA and Capital Crossroads hosted a Current Conversations on Water Quality field day event. Attendees could see the uncovered bioreactor, the old and new woodchips, and the scope of size before it was covered with a couple feet of soil. Iowa Nutrient Reduction Strategy Because of the experimental bioreactor installed in Bravard’s field in 2008, farmers and landowners now have another tool to reduce nitrogen entering rivers and streams. Field day attendees gather in Mike Bravard’s field at the bioreactor site, including ACWA president Harry Ahrenholtz, front. “All this happened before the Iowa Nutrient Reduction Strategy,” says Wolf. “This bioreactor was the first that actually had the science, data and information for it to become a cost-sharable practice with the USDA. It enabled bioreactors to be included in the Iowa Nutrient Reduction Strategy (INRS) as one of the eligible practices.” The strategy offers a suite of practices that farmers can implement to reduce nitrogen and phosphorus by 45 percent in Iowa waterbodies. A reduction of the hypoxia zone in the Gulf of Mexico also is a goal. Generally, bioreactors can remove nearly 43 percent of nitrates from the subsurface waters, close to the goal in the INRS. “Bioreactors are a practice that works well in a number of situations,” adds Hay. “It’s a good way to deal with the nitrate that we can’t keep in the field.” Carol Brown can be reached at cbrown@iasoybeans.com. demonstrated both professionally and personally. Given this reputation, it is most appropriate for the STC – an organization funded by and led by soybean farmers – to explore and promote opportunities to improve the infrastructure agriculture relies upon by not only asking, “How do we acquire the resources we do not have?” but also by asking, “How can we get more out what we currently have?” By approaching our transportation challenge with this perspective, the STC is prioritizing a number of key initiatives in 2018. Load testing technology To promote better evaluation and management of the state’s rural bridges, the STC has promoted the use of load testing technology. The greater utilization of this technology will reduce the likelihood of rural bridges being unnecessarily load restricted and increases the likelihood of taxpayer funding being allocated more strategically to those bridges that are truly in need of repair or replacement. The STC recently completed a pilot project with Midland County, Michigan, that is designed to be replicated in rural areas throughout the country. The technology employs the use of load testing sensors attached to the underside of the bridge. After the sensors are installed, test loads are driven over the various segments of the bridge surface to determine a precise understanding of the capabilities of the bridge. The pilot project in Michigan evaluated three load posted bridges. After conducting the testing, one bridge was able to have a 10 percent increase in allowable weight. The other two bridges were each able to have 30 percent increases in allowable weight. The load postings on all three bridges have therefore been removed. This project was designed to increase clarity of the condition of rural bridges – resulting in enhanced stewardship of both the bridges themselves and the scarce taxpayer dollars available to maintain them. increase the likelihood of lock and dam modernization projects being completed on schedule and within budget. This unpredictable and piecemeal funding approach results in materials and equipment for the construction effort becoming more expensive. If the Army Corps of Engineers, the agency responsible for lock and dam maintenance and construction, is provided funding assurance for only a fraction of the total cost of the project, the Corps will naturally only purchase materials and equipment commensurate with that funding level. If a lock and dam project, for example, will require five years to complete and if Congress only provides one year’s amount of funding toward that project, the Corps will purchase only one year’s worth of steel, concrete, labor, equipment, etc. Repeating this over the course of five years will result in a significantly more expensive project compared to one that received the full five years’ allotment of funding. In construction, better to make one five-year purchase of materials vs. five one year purchases. The unpredictable funding for locks and dams also results in inconsistent and sporadic construction. When funding is assured, work can proceed. When it is not, work will be suspended. This mobilization and demobilization of effort has a cost every time it occurs. and volatility (herbicide turns from liquid to gas). The advent of crops genetically engineered to tolerate dicamba and new less-volatile formulations to control herbicide-resistant weeds, particularly to glyphosate, contributed to its resurgence. Reformulated chemistries and strict label instructions help curb off-target problems, but they can’t stop it. Reported problems Dicamba drift injured 80 percent of a 115-acre soybean field farmed by Brian Kemp of Sibley. The American Soybean Association Board member estimates a yield reduction of 7 bushels per acre amounting to a $7,200 loss. He’s confident the liability insurance of the neighbor responsible will make it right. The longtime farmer and former Iowa State University (ISU) Extension and Outreach agent knows dicamba injury when he sees it, including stunted growth and cupped soybean leaves. Despite the best efforts of industry, he’s skeptical dicamba can be used during the growing season without issue. “I would like to see the chemistry work,” Kemp says. “I suspected there would be problems. That’s why I didn’t plant dicambatolerant soybeans. And, I shouldn’t have to plant them as a defense.” More than 2,700 dicamba-injury investigations were conducted nationwide to determine why problems occurred, according to data compiled by the University of Missouri. There were 110 in Iowa, records show. Typically, the state receives a dozen or less, says Iowa Deputy Secretary of Agriculture Mike Naig. He suspects if every complaint was turned in and not “handled across the fence,” Iowa Department of Agriculture and Land Stewardship investigators would be much busier. “Investigations help resolve local issues, determine what happened for insurance purposes and findings are sent to the EPA (Environmental Protection Agency) for future determinations on the product,” Naig says. Preliminary results from investigations show dicamba injury occurred all over the state and for various reasons — volatility, label instructions not followed and tank contamination were the most common. “We haven’t identified a particular trend that would be a silver bullet to fix,” Naig adds. Mike Owen (left) and Bob Hartzler, Iowa State University weed experts, discuss the pros and cons of new dicamba formulations to control herbicide-resistent weeds in Iowa. Movement worries Todd Claussen, director of agronomy for Landus Cooperative, doesn’t agree with the volatility statement. The co-op’s sprayer fleet applied two of the three approved post-emergent dicamba products to a “significant” number of acres in Iowa, Claussen says. Application protocols and label instructions were strictly followed, he adds, including buffer zones. Many applications were monitored and video recorded. “The manufacturers did a really good job building a protocol to make sure the product didn’t move off-target out of the machines — that is a fact,” Claussen says. “Fellow applicators said the same thing.” Yet, every Landus Cooperative sprayer hub location received an unspecified number off-target dicamba injury claims, which are being addressed. “It’s not because of drift coming out of the sprayer. The herbicide still has a propensity of volatilization,” Claussen says. “We had claims on farms that had injury in more than one direction from the target field.” Mike Owen, ISU Extension weed specialist, believes off-target dicamba applications widely occurred statewide. “A very small percentage were reported because of the Midwest ethos of getting along, working with your neighbors,” he says. “But if it happens again next year, I think the situation will be different.” Matthew Wilde can be contacted at mwilde@iasoybeans.com. rop protection companies and the government took steps to minimize the potential for drift damage to neighboring crops from dicamba for 2018. The Environmental Protection Agency (EPA) reached an agreement in October with manufacturers to reclassify new formulations of the herbicide as “restricted use.” Only certified applicators with special training, and those under their supervision, will be able to buy and apply Monsanto’s XtendiMax™ with VaporGrip Technology, BASF’s Engenia and DuPont’s FexiPan next year. New label restrictions and requirements are also on tap for the products spayed over-the-top of soybeans. Farmers, applicators and weed scientists hope new rules and regulations will reduce the thousands of dicambainjury complaints registered nationwide this year. Plantings of dicamba-tolerant soybeans are expected to more than double in 2018. ISU estimates were planted this year. Dicamba use is expected to increase as well. Some farmers plant dicambatolerant soybeans and use the chemistry for weed control. Others like the elite germ plasm and yield possibilities. Some will choose the traits as a defense against drift. April Hemmes of Hampton plans to use Monsanto’s dicamba products again after a successful 2017. The Iowa Soybean Association Board member doesn’t think the “restricted use” label and new rules will be a deterrent, though custom applicators believe their business will increase because of it. “For farmers like me who spray their own crops, we’re already certified. It’s not that big of a deal,” Hemmes says. “I had no problems and I like the weed control.” The conditional two-year registrations for XtendiMax with VaporGrip Technology, Engenia and FexiPan are set to expire at the end of next year. EPA says it will monitor the success of the label changes to decide whether to allow over-thetop use of dicamba beyond the 2018 growing season. •	CLASSIFY products as “restricted use,” permitting only certified applicators with special training, and those under their supervision, to buy and spray them. Dicambaspecific training for all certified applicators to reinforce proper use. •	REQUIRE farmers to maintain specific records regarding the use of these products to improve compliance with label restrictions. •	LIMIT applications to when maximum wind speeds are below 10 mph (from 15 mph) to reduce potential spray drift. •	LIMIT application times between sunrise and sunset. •	INCLUDE tank clean-out language to prevent cross contamination. •	ENHANCE susceptible crop language and record keeping with sensitive crop registries to increase awareness of risk to especially sensitive crops nearby. Monsanto’s plan to improve on-target applications of dicamba in 2018 •	ASSIST states in training herbicide applicators per restricted use guidelines. •	GIVE away approved nozzles to customers who buy Roundup Ready 2® Xtend soybeans and XtendiMax™ with Vapor Grip Technology. •	ESTABLISH a 1-800 number so applicators can receive help to understand the label and proper application techniques. The call center will be manned continuously manned by trained professionals. •	CREATE a training and education program for retailers. An Iowa Select Farms employee delivers a 5 pound pork loin during operation Christmas Meal at the Iowa State Fairgrounds in Des Moines. his is an easy time of year to start counting blessings. As your staff put together this issue of the Iowa Soybean Review, we realized there was much to celebrate. There are many soybean checkoff programs marking milestone years since establishment. Therefore, we’ve been calling this the “anniversary issue,” but it’s really an acknowledgment of where we are going by remembering how far we’ve come. I recently celebrated my 19th work anniversary at the Iowa Soybean Association. It’s not even a date I would have remembered if it wasn’t for LinkedIn contacts sending me congratulatory notes. However, it was a timely reminder. I’ve had the privilege of working in agriculture for nearly two decades. There’s never been a time in my life that I haven’t been connected to the land. I was lucky enough to have been born into farming. This fall, my daughter Jennifer and I were riding in the combine with my Dad. We were watching the corn dump out of the auger into the grain wagon. “Why didn’t you do this, Mom?” Jennifer asked. “Why aren’t you a farmer?” She wants to be a farmer when she grows up. I have every reason to believe she will be. However, I felt I had to answer carefully. But I’ve been thinking about her question. There are so many days, especially in the fall, that I wish I could be out in the field. It’s my happy place. It’s where I feel at home. But the truth is, my strength is in the story of agriculture. It always has been. I get to be apart of a beautiful narrative that I deeply care about. That’s not a bad way of spending the last 19 years. However, this is YOUR story. The programs and achievements outlined in this issue of the Review are because of the foresight and intelligence of farmers investing in the future. I’m grateful for the legacy that has been established in agriculture, and I feel blessed to be raising the next generation who will carry it on. Twin daughters of Iowa Soybean Review editor Ann Clinton watch their grandparents harvest corn this fall in southwest Iowa. ÂŠ10/2017 NuTech Seed. LibertyLinkÂŽ and the Water Droplet Design are trademarks of Bayer.